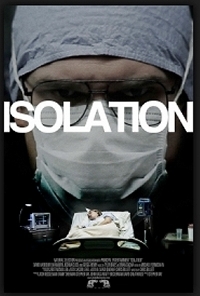 Stephen T. Kay, director of Boogeyman, Get Carter and HBO's Sons of Anarchy has a new horror flick coming out called Isolation and we've got the first ever seen footage for you. The film stars Susan Sarandon's daughter, Eva Amurri (who if you watch Showtime's Californication you'll no doubt recognize *ahem*) as a medical student who wakes up in a hospital isolation room having been exposed to an unknown disease. Desperately ill and with no recollection of how she got there, she starts to realize she's in serious danger. Isolation also stars The Green Hornet's David Harbour along with Joshua Close, Gregg Henry, Robert Wu and Michelle Greathouse. The promo trailer we've got is a little spoilery so be warned. So the teaser is nothing but Shaquille O'Neal? That is the only thing that played. "The promo trailer we've got is a little spoilery" ?? It basically gave away the whole film!!! This ran right past "Spoiler" and slammed into a wall of "Completely Spelled Out!"